Actually, everything at the grocery store looks tempting. You know that whole “don’t shop when you’re hungry” thing people tell you? Yeah, thanks. Why do people go to the grocery store? To get food. Because we ran out. So how in holy heck are we supposed to eat before we go? It’s a totally unreasonable expectation. Plus, I enjoy my drool time in the bakery section. Don’t take that away from me. I’m sure a lot of advice out there is good, but it doesn’t translate practically. For instance, as a woman above 35, I’ve been told to drink a glass of water before all my meals to curb my hunger. But first of all, well, I’m hungry. I wanna eat now. And even if I think ahead and chug my water 30 minutes before a meal, I have to hit the bathroom by the time the meal rolls around. And I’m often teaching classes, so I can’t hydrate and then leave my kids to rush off to the loo. It just doesn’t work that way. Another common piece of advice is to sleep eight hours every night. Yeah, right. Assuming I get to bed with eight hours of lead time, something will mess it up. One of my kids will wake me up, or my husband will accidentally roll over me (he’s a restless sleeper), or I’ll have to use the bathroom, or a crazy thunderstorm will hit. And then, I’m up. It’s impossible to go back to sleep, because then the mind race begins. If you’re a woman, you know what I’m talking about. The to-do list begins to build until it reaches a fever pitch, and then you’re there, in the dark, staring at the ceiling and counting the bazillions of things you have to do the next day. Eight hours of sleep, my a$$. Any more wise nuggets out there that really don’t work? Let me know. We can make a whole list and make fun of all the stupid advice out there. Then we can print it out and burn it. Too far, huh? Sometimes I cross that line. Ahem. Back to cookie cake. One piece of advice that will never be bad? Eat dessert. Especially if it’s a pumpkin cookie cake blinged out in pumpkin spice cream cheese frosting. I got the pumpkin spice cream cheese a month ago at the grocery store (Philadelphia makes it) when I was, of course, hungry. All I knew as I grabbed the tub of cream cheese was that it would come in pretty handy sooner or later. And here we are. 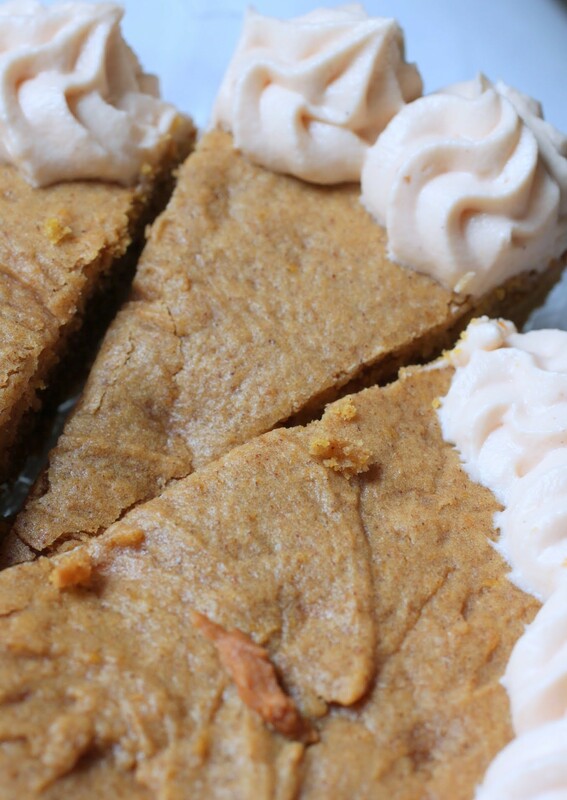 If you love cream cheese frosting, you’re going to love the pumpkin spice kind even more. 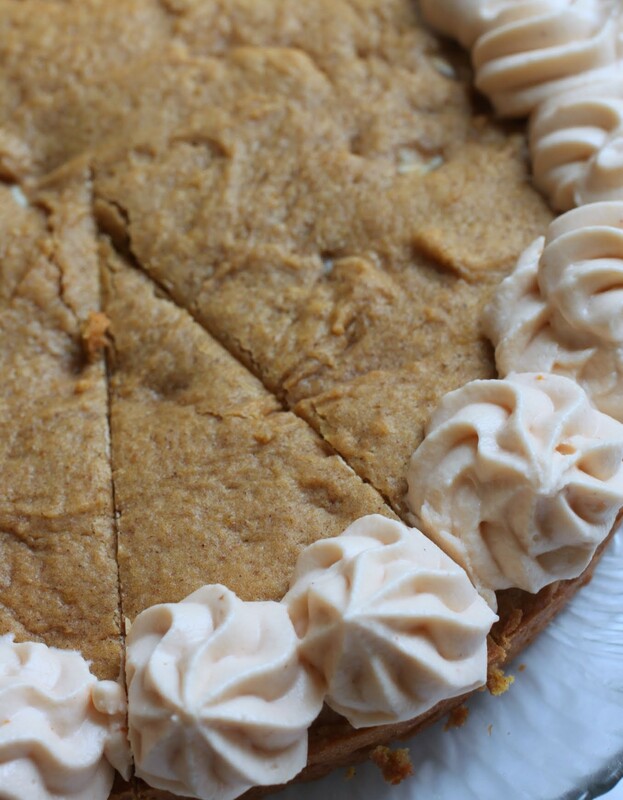 The cookie cake itself is a perfect use for pumpkin cookie dough. You see, because of a high moisture content in the pumpkin, pumpkin cookies never work out if you add eggs. The dough gets too cakey. So yeah, you can eat the dough off your beaters, but more important, this recipe makes for a fantastically dense cookie cake experience. You’ll enjoy it, I promise. And white chocolate chips can never hurt, either, so in they go! Believe me, I’m the last person to be giving advice, and I’m also not so good at taking it. But some pieces of advice are easier to swallow than others, especially if what you happen to be swallowing is a cookie cake. Trust me on that one! Preheat the oven to 350. Line a 9-inch round pan with parchment paper. Coat the bottom and sides of the pan with cooking spray. Set aside. In a bowl, mix the melted butter and the sugars until smooth. Add the vanilla and pumpkin, stirring until fully combined. In a separate bowl, combine the dry ingredients. Combine the pumpkin mixture with the dry ingredients and stir until a soft batter forms. Fold in the white chocolate chips. Press the dough into the pan evenly. Bake until golden at the edges and set in the middle, 25-30 minutes. Cool completely. 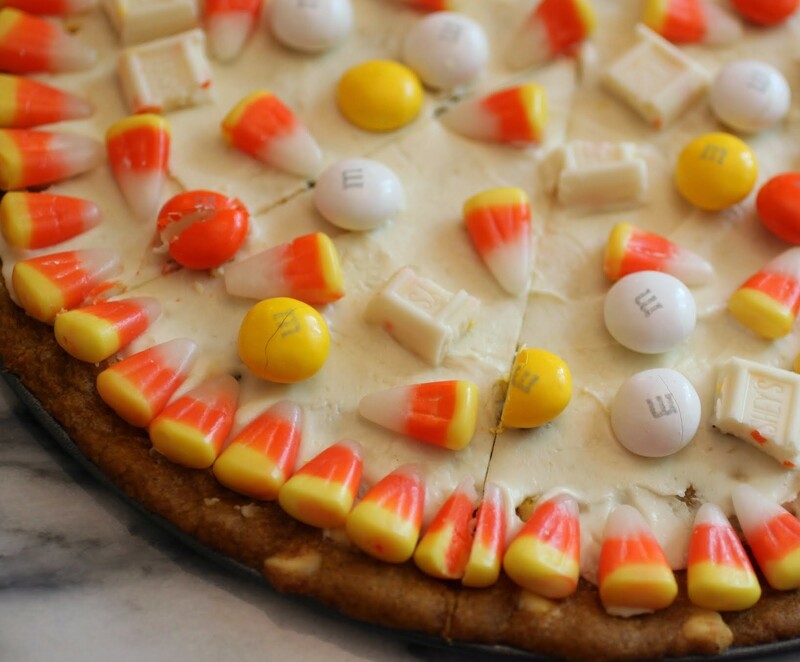 Carefully invert the cookie cake onto a plate. Make the frosting. In the bowl of a stand mixer, beat the cream cheese, butter and vanilla until fluffy. Gradually beat in the powdered sugar until the frosting is smooth and spreadable. Prepare a piping bag with the tip of your choice. Fill the piping bag with frosting. Decorate the cake as desired. Oh this cookie cake looks SO good, Mir! Cookie cakes are one of my favorites, so I can only imagine how delicious this must taste, especially with that cream cheese frosting! Thanks, Gayle! The pumpkin spice cream cheese makes the BEST frosting! It’s the only advice I’d ever want to take, Kate! Mir, you are hilarious! and isn’t it funny that it takes holidays to force us to go digital-free for a couple of days? I hope you enjoy your time away and the purpose of the holidays! anyway, haha, funny you mention that chugging the water thing before eating. My mom had me do that when I was a kid to try to help me eat less. it didn’t work on me. I just had to pee a lot more. 😛 I love the drink a cup of lemon water every morning. . I think it’s good for your complexion and just good for overall health, but I only made it for like 2 days. I just need my coffee in the morning. Don’t take that away from me. . and I need a big slice of the pumpkin spice cookie cake!!! delicious! You know I love my cookie cakes! 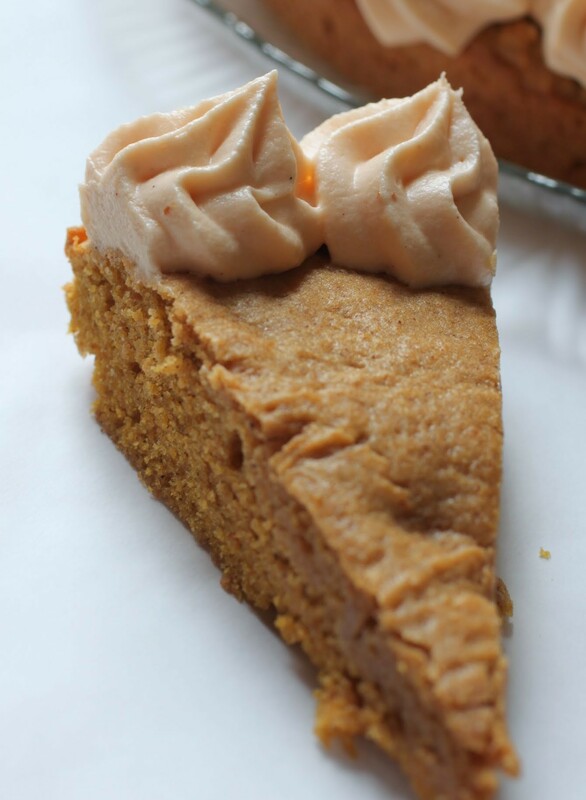 I’m dying for a piece of this pumpkin one – yum! And I’m with you – 8 hrs of sleep? When does that ever happen? I wish! I love cookie cakes! 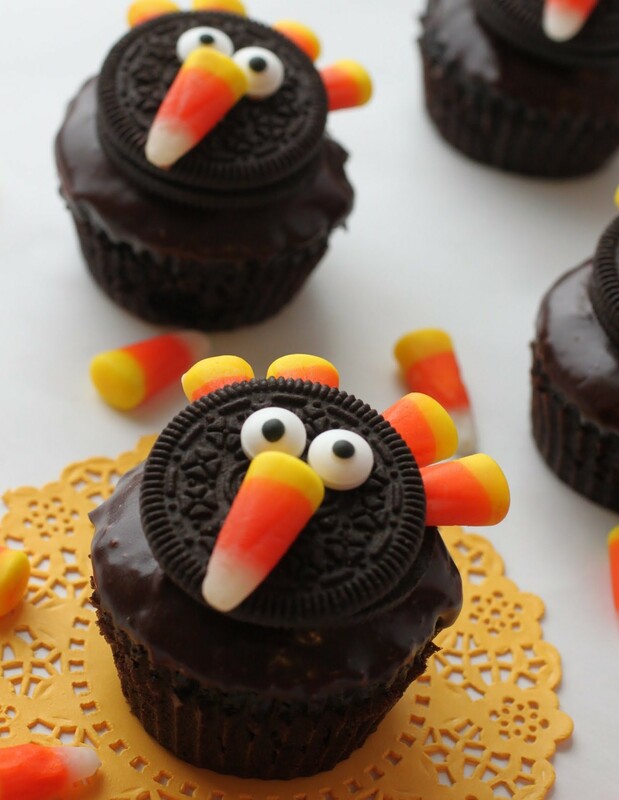 I could gobble up this pumpkin spice one! I bet it’s especially good with the cream cheese frosting. That pumpkin spice cream cheese is ridiculous, Jen. You’ve gotta try! Cookie cakes are just the best! 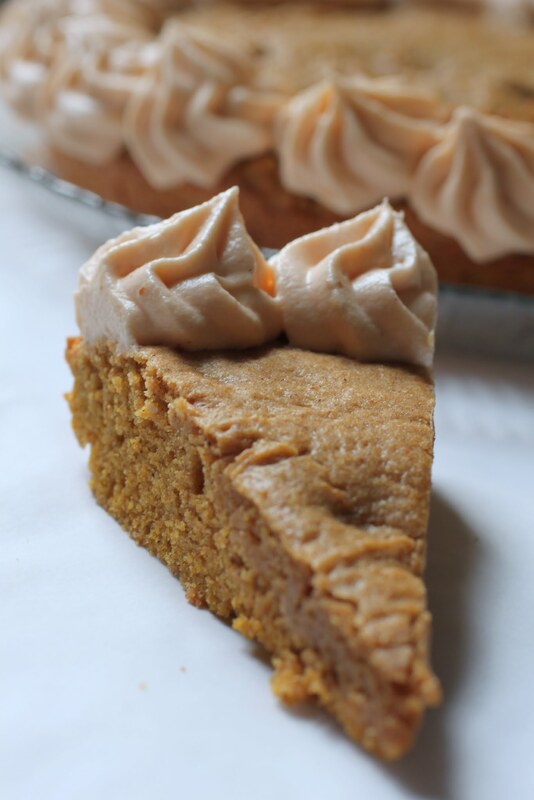 Love the frosting with the pumpkin spice cream cheese- that sounds awesome! Medha @ Whisk & Shout recently posted…Nutty Vegan Maple Chai Oat Blondies! Thanks, Medha! They are the best. 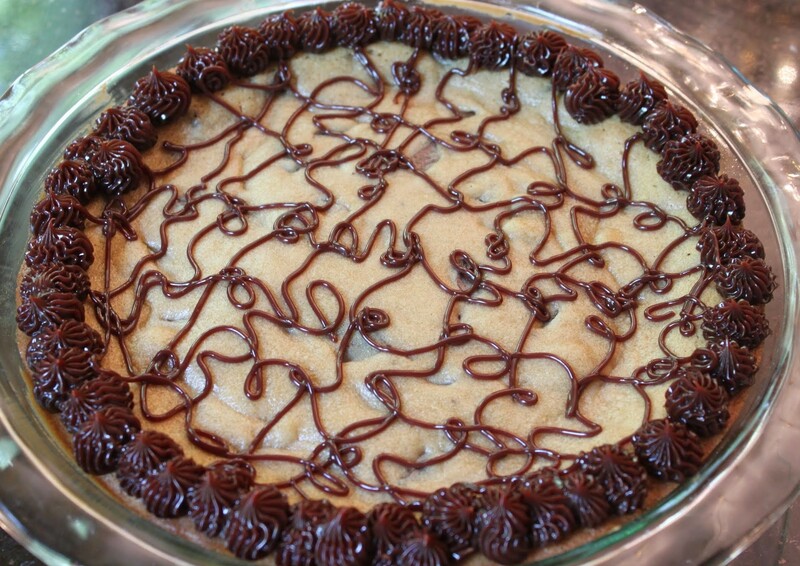 This cookie cake is calling my name! 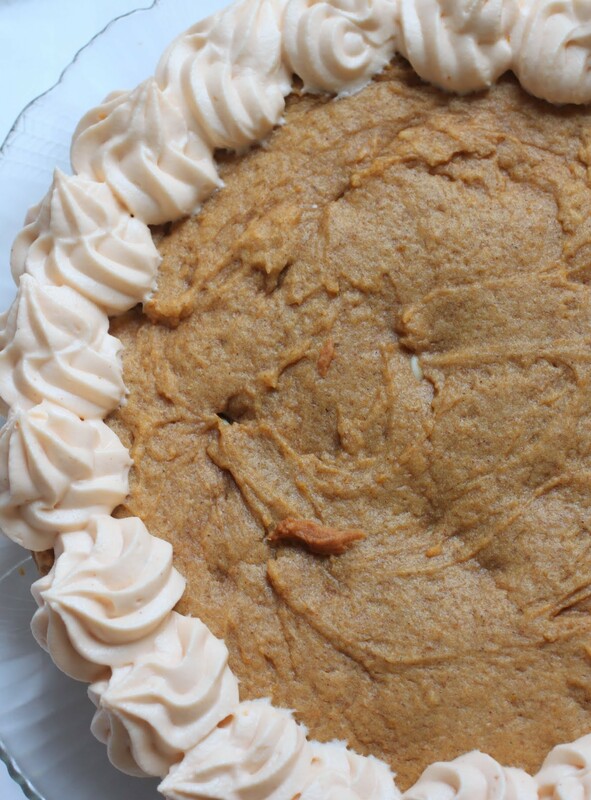 Love that you used the pumpkin spice cream cheese too, what a great idea! Thanks, Danielle! It worked out great! 8 hours of sleep? Who am I? Oprah? I think maybe I had that much sleep when I was 12, but not since then. I love this pumpkin spice cookie business. I’m too tire to make it so I hope you will send it to me. I loved that Mir – and agreed with all of your examples of crazy advice! 8 hours of sleep is definitely impossible and I’m always hungry at the grocery store! This cookie cake looks just fantastic too! The grocery store is the best place to be when you’re hungry! WOW! THAT sounds amazing. And I never get a full 8 hours sleep either. You are so right about the mind racing. Def is a woman thing! I wish my mind could stop racing at night. But nope. Not meant to be!